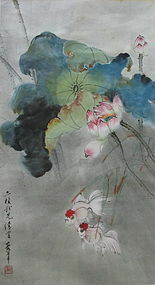 Mounted Chinese painting of goldfishes swimming among lotuses attributing to the Taiwanese artist Ou Hao Nian (1935~). The view appears as if it was a view of the lotus pond during the rain. The painting contains a signature and seal of the artist. Age: Late 20th century Size: length 42.25" height 23.25"